Let’s talk about camping furniture. 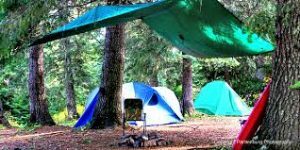 What you need will depend on your campsite and your comfort level. Remember in my first post, Selecting Campsites, I mentioned that there are sites with benches and tables and there are sites without them. You may or may not want to invest in some tables and chairs, but if you do, you won’t be limited in where you camp. 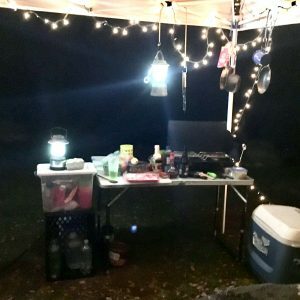 Tables and chairs: I camped without tables and chairs for a year (I camped without most things for a year). As long as I camped in sites that had a wooden bench (they were huge) it was great. I found many, but this issue did limit my choices. 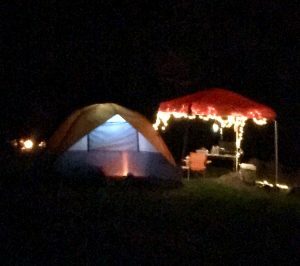 Once I bought a fold up table and some simple camping chairs, I was able to camp anywhere, so it opened up the possibilities. You can buy simple beach chairs for as cheap as $6, and get some more durable, more comfortable ones as much as $40-50. A few months ago I bought some Christmas lights. Yes, they need to be plugged into a generator, which can be pricey and loud. I bought the cheapest generator I could find, and that was very loud. 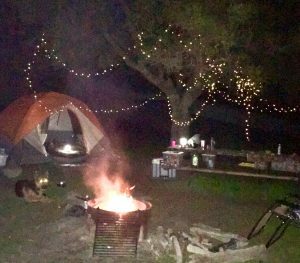 I didn’t like it, I couldn’t imagine camping near other people – for sure it would be annoying. And I didn’t want to disrupt the quiet of the outdoors, afterall, the reason most of us are going there is to get some peace and quiet. I realized that no matter how much I spend on a generator, they will still make noise. My solution: solar powered Christmas lights. it’s perfect. Doesn’t make any noise, but gives enough light to see what I’m cooking, what I’m doing, enough light inside the tent and it gives a nice ambience. and very inexpensive. 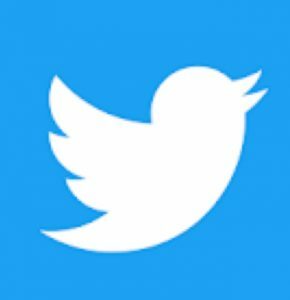 Canopy: I just recently bought a canopy. Not bad for $45. It protects against the elements, sun, and rain. You can hang your lanterns and lights around it giving you a lot more comfort. This is definitely optional and of course you probably need to have a truck so it can fit, it wouldn’t fit into a car / SUV. I usually don’t see many canopies around. tarp: a much cheaper and easier alternative is buying a tarp. You can tie it to a few trees to give you a “ceiling”. Once you find a spot that gives you a few trees to use, you’ve got it, although this can be challenging in some cases. 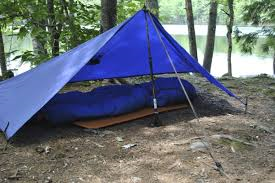 By the way, a tarp can be used in many ways: cover your firewood from becoming damp at night, make a primitive tent, etc. buy a tarp and you can use it for shade, or a tent. It might be kinda fun to set it up in different ways each time.